Are you ever lost for words? Do you ever wish you could express your true feelings better? Good news! With the handy personal mime you will never fail to communicate again. 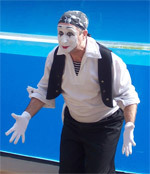 The personal mime goes with you everywhere and will translate your feelings to all those around. Want to tell someone you love them? The mime will do it for you. They just need a spare couple of hours in order to hear it. Got an important business meeting? Take the mime. You will really wow them and win the contract. The Personal Mime. We asked Mr S of Ashby De La Zouch how he was getting on with his mime. He replied " ". Now who can argue with that? !